When jewellers make silver boxes they do not use the conventional folder. This gives slightly rounded corners and truly square corners look much better. The box is made out of one piece of metal. Where the folds are the sheet is cut forming a v-shape cut. This is done using a double-sided 45° cutter on a horizontal arbor (in the horizontal socket). 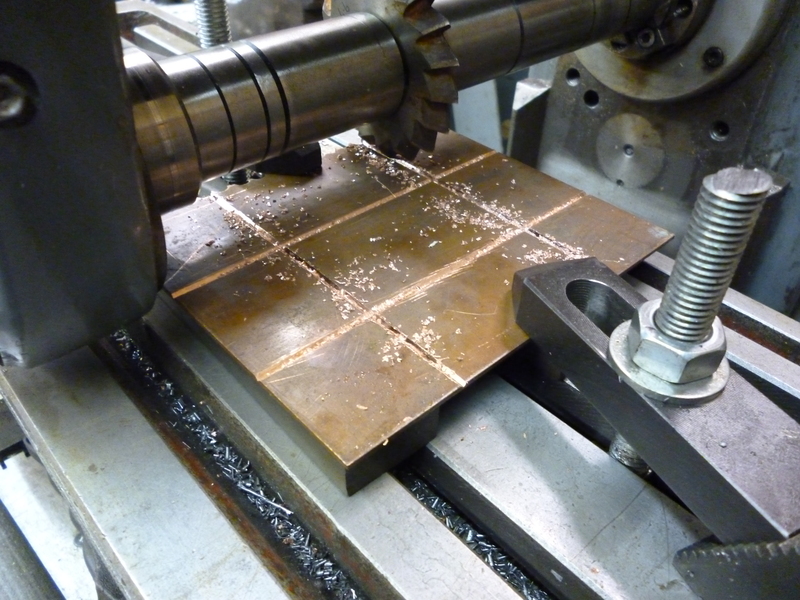 Thin sheet is seldom really flat so, ideally, the sheet is clamped all along points where it is to be machined. In practice the cutter is not big enough to be able to clamp the workpiece on top. Though the cuts are not meant to go all the way through, the workpiece is mounted on parallels but even these are not directly under the cut. This is used to machine along all the inside edges of the box where they are folded but not right through the sheet of silver. For a rectangular piece of silver sheet this needs two cuts along the x-axis and two along the y-axis. Small differences in flatness will make relatively large differences in the thinness at the thinness part of the V’s. For a copper sheet which is 2mm thick the V’s need to be about 1.75mm deep so the part that is actually folded is only 0.25mm thick. This can easily be folded using the finger without any difficulty. But, before folding, it is essential to clean up the V’s with a fine file. Small pieces of copper swarf can easily get welded on and these will stop the sheet being folded to a perfect 90º. A fold like this can only be done once, undone once and folded, if necessary, again for the second time before the joins break completely. The corner pieces that are not needed can be sawn diagonally and can then be broken off by bending then to and fro. The box is folded and the corners and edges are then soldered with silver solder. see Solder and soldering for silver solders to be used if the object is to be hallmarked. It is possible to machine the edges of the box using a slitting saw whilst the work piece is set up to mill the V-shapes. But it is unlikely that the edges will all be the same height. So the soldered box is clamped to the milling table and the tops of the sides milled so they are all the same height. (For reasons the reader will probably appreciate, copper has been used in the example). A small (but I think significant) point, John, regarding Hallmarking and Silver soldering. Silver items (Fine, Britannia or Stirling) can be Hallmarked when soldered with Hard, Medium, Easy or Extra-easy Silver Solder – Indeed it must be Hallmarked if it weighs more than 7.78gm. It may be that you are referring to Silver Solder that is available via ‘engineering’ supplies and I am not familiar with the composition of that – I buy my Silver Solder from CooksonGold – a Bullion dealer – so may by ‘barking up the wrong tree’. I use genuine silver solder of various grades with various melting points when do model engineering. However I did do a course on making silverware some time ago and I was told to use bits of left over silver sheet cut into small parts and then using borax as a flux because of this. I was told this was necessary if the workpiece was to be hall marked. The silver solder used in engineering is a long way from being pure silver. It used to contain cadmium but this is now not allowed. I dont know what it is currently made from. Thanks for your comment I shall check this out and update it. Thanks for the confirmation about ‘engineering’ silver solder – good to know my assumption was correct. As far as I can tell it seems that any silver solder used for jewellery must contain at least 75% silver. On the other hand all of the grades of silver solder produced by Johnson Matthey for engineering purposes never contain more than 60% silver. I hope to do a page on silver solder soon. I’ve just researched both CooksonGold and Johnson Matthey web-sites and see that JM’s Hard, Easy & Extra Easy solders have 66.7% and the Medium 74%. CG Hard and Easy are specified as 67.1% and their Medium at 74.1% They don’t specify the % on Extra easy but I assume 67.1. I use CG’s H, M & E on my jewellery and don’t have a problem with Hallmarking. The Assay office even allow adhesives under some conditions. It did occur to me that using ‘left over bits of silver’ would be a problem since by the time that melted (Fine @ 961ºC Stirling @ 893ºC) – so would the item! It is over 20 years since i made my silver candlestick – you could well be right. I have tabulated all the silver solders from 4 suppliers on a webpage. My conclusion is that it all comes from Johnson Matthey. I cant get the details each kind to show up on my display. What is it that makes the ones for hallmarking different? Oops, sorry, left a link out. Still don’t see a link, John. – assumed it would be on your ‘Soldering/Brazing’ page but no real data there either. I have just tried this and it seems to work as it should. I think my best bet is to wait till the weekend and try it out on my partners computer. I will get to you early next week. Everything seems to work when I tried this from elsewhere. But I have put a pointer to solders and fluxes on the home page that you might like to try.